Teledyne Marine Imaging provides acoustic imaging solutions (sonars) and optical solutions (underwater cameras and lights), which are developed by Teledyne RESON, Odom and BlueView and Teledyne Bowtech respectively. In this article we will focus on Teledyne Marine’s advanced multibeam echosounder and sonar solutions servicing a variety of markets and applications. Singlebeam echosounders and entry level multibeam bathymetric echosounder systems are manufactured by Teledyne Odom Hydrographic, while high resolution multi beam echo sounders for deep and shallow water and long range forward looking sonars are manufactured by Teledyne RESON. 2D forward looking sonars, as well as 3D multibeam scanning sonars, are developed by Teledyne BlueView. Teledyne Marine Imaging has facilities in Denmark, The Netherlands, Germany, U.K., the USA and China. For support, a global sales network of distribution partners in more than 47 countries in operation. The organization counts over 40 engineers and hydrographic surveyors working from six service centers. The first hydrographic charts originated in the 13th century in Italy, Portugal and Spain. Known as portolans, these were produced to provide realistic descriptions of coasts and harbors and to aid navigation offshore. The earliest charts depicted routes, obstacles and wind directions, but contained no depth soundings like modern day charts. In the 17th century, lead line markings were used in England for recording depth measurements. This method was slow, labor intensive and had limited accuracy due to water currents and low accuracy positioning techniques. By the 20th century, single beam echosounders came into use, using acoustic transmitters and receivers to measure depth based on the time difference between the acoustic transmission and received echo. However, single beam surveys still had many limitations compared to modern day surveys; namely low sounding density, which made for difficulties in finding accurate feature definition. 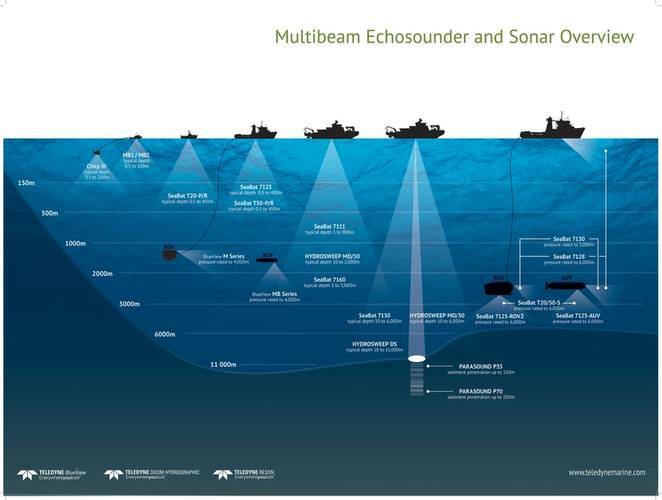 Technical advances in subsequent decades saw multibeam echosounders come into use, with the first systems developed for military purposes in the 1960s. Multibeam echosounders measure multiple depths over a wide swath perpendicular to the heading of the survey ship using advanced acoustic techniques and, when combined with accurate navigation data from GNSS systems, allow rapid generation of accurate seafloor maps. 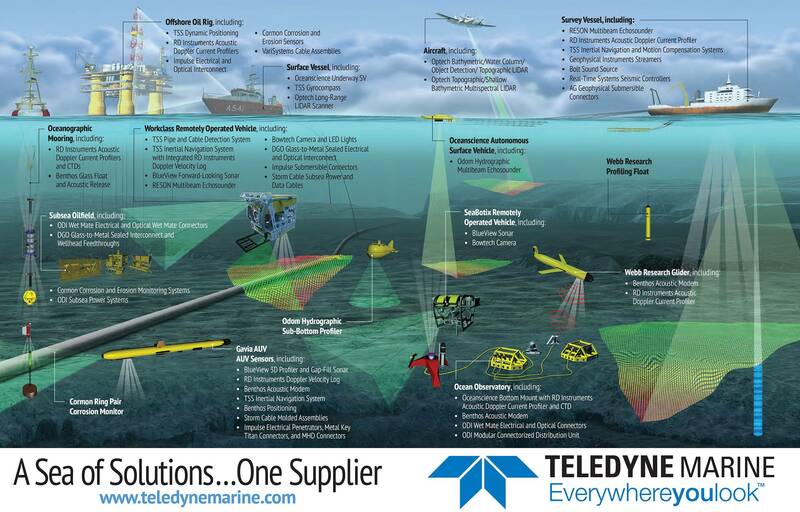 This article highlights and addresses the most important markets served by Teledyne Marine Imaging with Hydrography, Dredge, Civil Engineering, Energy and Defense & Security. Within Hydrography, Teledyne Marine Imaging provides a product portfolio for seabed mapping from full ocean depth deep water to shallow water. Within that range, Teledyne Marine Imaging can match the client’s requirements for size, ease of use and performance with a quality package according to the budget specifications. Major applications include seafloor mapping, port and harbor surveying, route surveys and ocean science. Teledyne Marine Imaging also provides supporting sensors and accessories such as sound velocity sensors, brackets, mounting kits, gondolas, and cables, as well as motion compensation and INS systems. 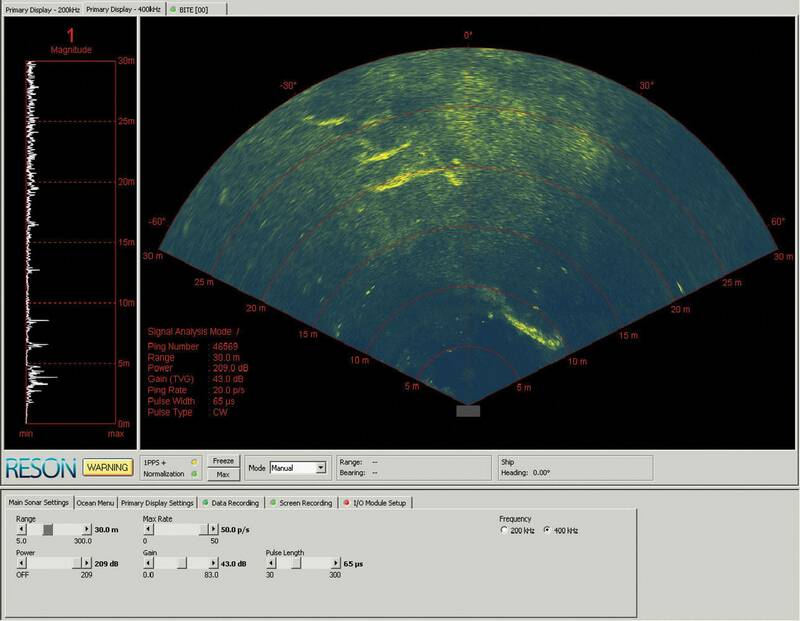 Teledyne PDS’s software solutions provide turnkey packages for Teledyne Marine Imaging’s singlebeam echosounders, multibeam bathymetric sonar systems, and multibeam scanning sonars. All sonar solutions produce industry standard data to interface with all major hydrographic sonar data collection packages. Energy is a primary focus in Teledyne Marine Imaging. The forward looking imaging sonar from Teledyne BlueView and the cameras from Teledyne BowTech assist ROV operators navigating around offshore subsea structure, and for pipeline surveying many companies use the SeaBat 7125 and T50-P. 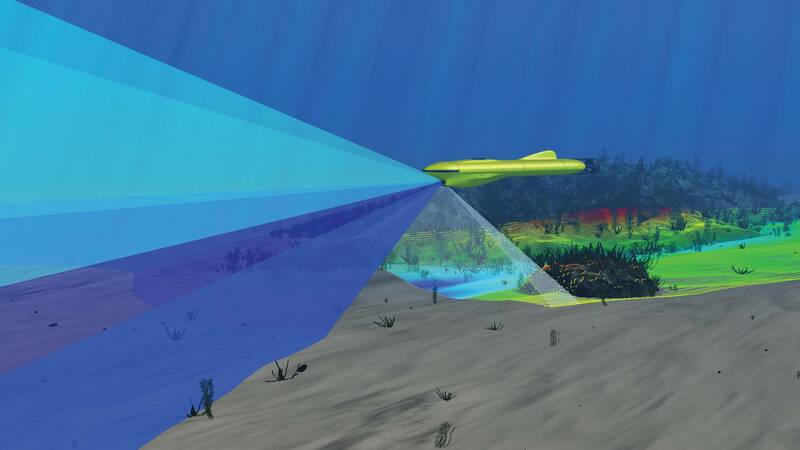 Features such as target detection systems for ROV station keeping and automatic tracking systems to detect and follow pipelines are Teledyne Marine developments. Main applications are pipeline surveying, metrology, inspection & monitoring, obstacle avoidance and leak detection. 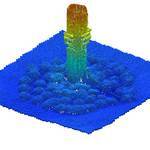 Teledyne Marine Imaging’s sub-bottom profilers look deeper. With a bottom penetration upto 200m the ParaSound can visualize structures from 15cm, buried objects can be localized prior offshore cable trenching, or geologically stable pipeline routes identified. Teledyne Marine Imaging offers a suite of solutions to support civil engineering & dredge operations. The product range includes hydrographic grade singlebeam echosounders, sub-bottom profiles and sound velocity profilers by Odom Hydrographic, 2D imaging sonars and 3D multibeam scanning sonar by BlueView and the SeaBat world leading range of multibeam echosounders all coupled with the power of Teledyne PDS software for hydrographic surveying and dredge guidance operations. The organization thus provides a range of acoustic and software solutions to meet the demands of the civil engineering and dredge market. Main application areas are, pre and post dredge surveys, dredge guidance, construction support, bridge dam & harbor inspection and scour and undercut monitoring. Teledyne Marine Imaging supports Defense & Security needs offering Commercial-off-the-shelf (COTS) products providing high performance combined with the cost of ownership through the product lifecycle typically much lower compared to bespoke products. Teledyne Marine Imaging is represented by products from RESON and BlueView including multibeam echosounders for tactical bathymetric mapping, 2D forward looking sonar and hydrophones widely used by navies and institutes around the world. Main applications include terrain mapping, obstacle avoidance, mine counter measures, diver detection and first responder support. Surface vessels often rely on charts for safety of navigation, but for naval operations charts are often unavailable. 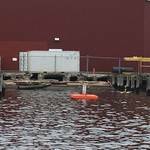 Underwater vehicles must avoid objects in their path and are often fitted with singlebeam scanning sonars. Their slow update rate only covers part of the forward sector at any given instant. Long range SeaBat and HydroSweep systems can operate on surface vessels at down to 11,000m depth, whilst the most compact low-power BlueView 2D sonars arerated to 3,000m, thus covering a wide range of applications. For the support of first responders, Teledyne Marine Imaging solutions include 2D multibeam imaging sonars such as the RESON SeaBat 7128 for surface vessel mount, to the more compact BlueView multibeam sonar, suitable for surface vessel use or on portable low logistics ROVs and diver hand units. 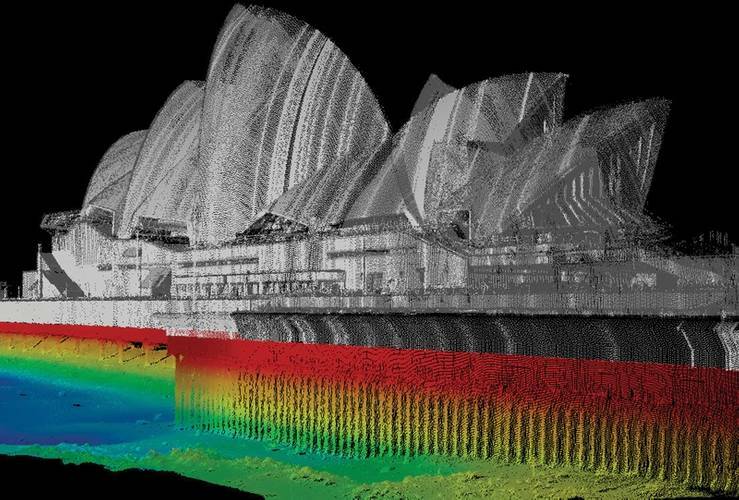 Port Authority of New South Wales (PANSW) — formerly known as Sydney Ports Corporation — is responsible for monitoring bathymetry for both the safety of general navigation but also to ensure the safe berthing in the commercial harbor in and around Sydney. PANSW also maintain various oceanographic equipment such as tide gauges, wave rider buoys, current meters and anemometers. For the purpose of asset maintenance of wharves and berths around the harbor, PANSW wanted to evaluate the use of a mobile laser scanner, as opposed to using more traditional means like manual GPS-fixes, total stations, terrestrial based laser scanners etc. — as a part of their daily routines. The potential uses of a mobile laser scanner are numerous. Besides monitoring berths and wharves, other types of surveys could add value to a potential investment. Beach replenishment monitoring and breakwater surveys being examples of potential environmental surveys — and in its nature a mobile laser scanner can also be used as a terrestrial scanner. An OPTECH Ilris laser scanner was installed on the PANSW survey boat, Port Explorer. Port Explorer is already equipped with a state-of-the-art shallow water multibeam sonar system — the RESON SeaBat 7125 — and a well-accepted industry standard, the POS/MV, for positioning and orientation. For the feasibility study PANSW had a dedicated laser mount manufactured and had accurately measured the offsets and angular misalignments relative to the POS/MV; essential details when trying to achieve high accuracy results. Accessing bollards and certain quaysides can be challenging enough from a health and safety perspective but to get out on breakwaters and other fix points can be almost impossible — but they are all typically clearly visible from the seaside. Using a high-resolution laser scanner in combination with a high-accuracy orientation and positioning system could prove to be the tool required to monitor many of the above water assets,combined with monitoring the bathymetry below. Teledyne PDS was used for the calibration, acquisition, initial processing and visualization of data. One of the challenges is the noise which is generated close to the water line, both in the sonar data and in the laser data. In rough conditions it may be required to plan the survey in two stages: a bathymetry survey during high tide, and a laser scanner survey during low tide, ensuring sufficient overlap in the data sets. Another challenge is horizontal and vertical accuracy of the laser data. 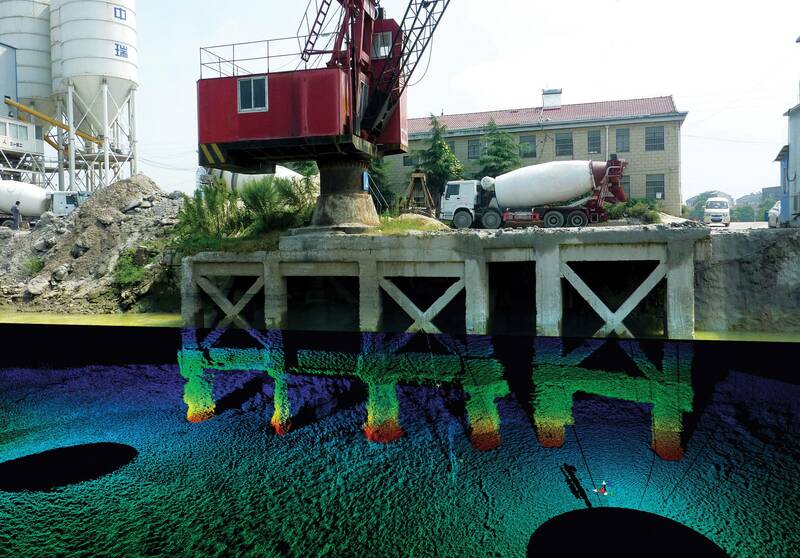 Both a mobile laser survey and a bathymetry survey depend on the accuracy of external sensors. The laser survey is potentially used to monitor minute changes in structures’ absolute position and the laser scanner itself provides millimetric accuracy, but the final point accuracy is obviously no better than the achieved positioning accuracy — and add to this motion sensor accuracy which compensates for vessel movements experienced during the survey. Real time positioning accuracy is typically centimetric and in order to improve positioning and motion data, raw data is usually post processed. However, even after post processing laser point cloud accuracy will typically be governed by the accuracy achievable by the external sensors. The customer needs to evaluate whether the advantages of mobility and accessibility to remote structures takes precedence over the reduced accuracy. The trial proved that it is definitely possible to achieve a virtually seamless surface between the sonar data set and the laser scanner data set. It was often possible, in one run, to achieve full coverage between the two sensors and the data virtually combined into a seamless surface. 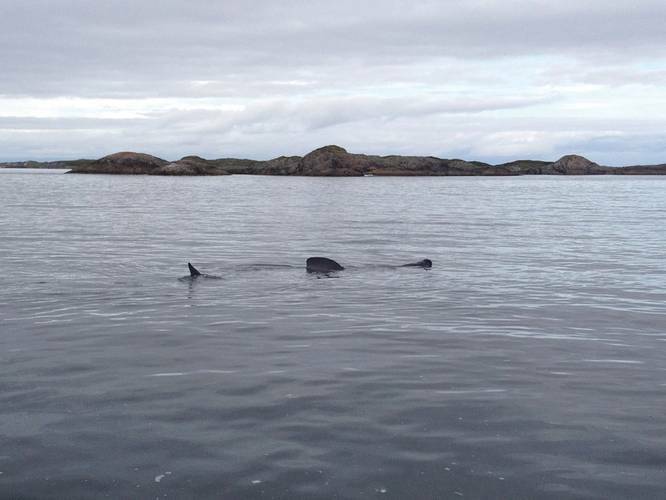 Scope: Biologists from Aberdeen University wanted to find out if sonar equipment could be used to learn more about the movements of basking sharks. Most of the current knowledge about basking sharks is based on what is visible at the surface and, as such, an investigation was sought to determine if surface observations matched what was happening below the surface. In particular, the scientists were interested to know if the sharks were ‘stacking’, and whether there was evidence of young sharks. The challenge is to use a forward-looking sonar to observe the movements of basking sharks beneath the water surface, in order to better understand their behavior. Underwater visibility is poor in this location, thus standard underwater cameras are ineffective. Furthermore, the sonar provides a significant advantage over alternative observation methods with its long range detection capability, which makes it possible to observe the sharks from a long distance without impacting their natural behavior. The ultimate aim is to understand why Basking Sharks come to UK waters during summer. The problem is that our present understanding of Basking Shark behavior is based on what we observe at the surface. However, Basking Sharks spend most of their time below the water surface and we need to see below in order to fully understand their social behavior. As well as monitoring their general movements and behavior, scientists wanted to search for the presence of young sharks, as this could be evidence that the sharks are travelling to mate. To achieve this aim, a SeaBat 7128 forward-looking multibeam sonar, with dual 200/400kHz frequency, was utilised. Only the 400kHz option was used, as ranges were typically less than 100 meters. The SeaBat 7128 was mounted over the side of a small fishing vessel. The vessel transited to Basking Shark ‘hotspots’, where the real-time sonar image display was used to monitor shark activity. The sharks gave a clear response on the sonar display. It was possible to distinguish between different parts of the shark’s body on the acoustic images. For example, the pectoral fins were visible, and the tail could be seen sweeping from side to side. In many instances, more sharks were visible on the sonar than appeared at the surface. Sharks were observed closely following each other, swimming parallel to one another, and swimming towards plankton (food) patches. 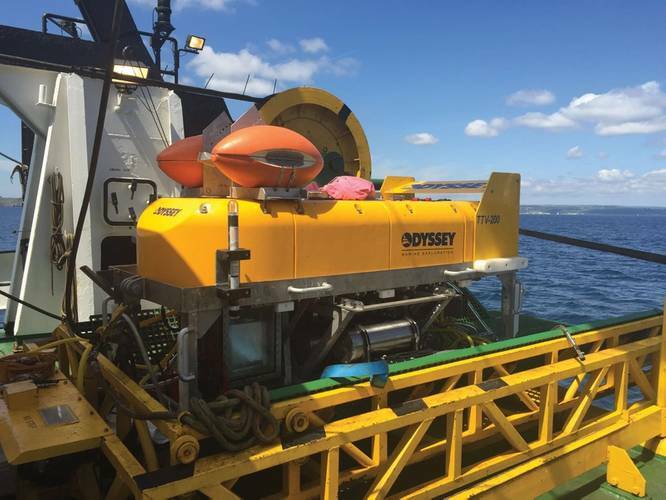 Odyssey Marine’s primary aim is to find and identify large ship wrecks on the seabed, which are typically 50 — 80 meters in length, from the World War I and World War II eras. The exact location of the wrecks is unknown, thus the challenge is to map large swathes of seabed in a short time to allow fast identification of potential targets. The maximum depth is 6,000 meters, and the aim is to map over a 1,000 meter swath within a single pass. The challenge was to design a system for mapping large areas of the seafloor, in very deep water, so that large targets may be identified. The system should be deployed at a sufficient altitude suchso that seabed coverage is maximized, while providing the necessary resolution to detect large objects in the data. 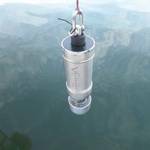 The system needs to accommodate multiple sensors for recording georeferenced and motion compensated depth soundings. It must be able to be towed smoothly above the seafloor at a range of altitudes, typically 60 — 150 meters. The other challenge is that the only connection and contact with the vehicle is through a tow cable. Furthermore, since the water is very deep, the tow cable must be very long. The TTV-200 vehicle was developed by Teledyne Benthos to accommodate all the instruments. Teledyne RESON supplied a dual head SeaBat 7125 system for mapping bathymetry and backscatter data, as well as being responsible for the software and hardware integration to make the system function as it should. Odyssey Marine supplied the 10,000 meter tow cable, deck winch and towing vessel. The dual head SeaBat 7125 multibeamechosounders are configured with an outward 50 degree tilt to maximize seabed coverage. There is a low frequency option (200kHz), from which a 1,000 meter swath may be achieved at 120 meters altitude, and a high frequency option (400kHz) which may be used to capture enhanced details over potential targets. Both systems utilize a software and hardware feature that provides extended range performance using frequency modulated transmission. Teledyne PDS software was used to integrate sensor data, georeference soundings, and visualize the resulting seabed images. The companies of Teledyne Marine are hard at work to provide a new customer experience. Each can tap into Teledynewide resources. 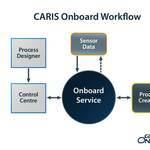 Thus, they can supply new tools and experience to help customers resolve complex challenges. Further, management foresees a coordinated approach to systems reliability. Test plans and results will show how an assemblage of Teledyne products operates as a system. Customers will have a streamlined and simplified experience compared to working with multiple vendors. There will be a single focus for point of origin, terms and conditionsand warranty and the opportunity to manage a single purchase order across multiple brands. 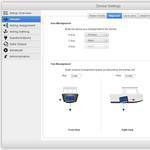 As another benefit, Teledyne Marine clients will see fewer compatibility issues. As experts in their core technologies, the individual field sales/business development teams and the technical fields reams are being trained to recognize applications where the expanded Teledyne Marine solutions set can add value to our customers for bundled and integrated solutions. These field teams can bring in subject matter experts as needed and will act as true consultative technical sales resources.In short, Teledyne Marine expects customers will see advantages in not only less time and cost of doing business but reduced risk — technical and performance.